It's a big day for Joss Whedon news. Whedon's The Avengers has conquered the worldwide box office to the tune of $1.44 billion, and is now setting its sights on the home-video market with a September 25th release date for the film on Blu-ray and DVD. But while The Avengers is absolutely worth of all the success and praise that's been flung its way, Whedon's name was also attached to another of the year's best films, one that sadly flew under the radar thanks to defying easy categorization and a marketing campaign that made it look like the very thing it was satirizing. Yes, in a perfect world, The Cabin in the Woods would have made a zillion dollars and earned the devotion of more than just the small handful of us who saw it and have been evangelizing about it ever sense. But there's still hope. Cabin is the sort of movie that has a tendency to blow up and find a huge following on DVD, so I'm keeping my fingers crossed that it will finally find the audience it deserves. Now, thanks to a post on the film's official Facebook page, we've got a look at the cover art and the release date: September 18th, the week before The Avengers arrives. Cabin in the Woods was co-written by Joss Whedon and co-written/directed by Buffy the Vampire Slayer alum Drew Goddard. 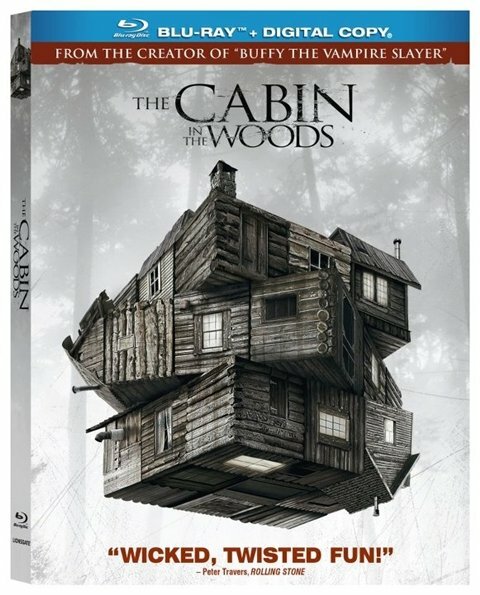 Cabin still isn't available for pre-order on Amazon yet, but that's bound to be coming soon. We'll keep you posted once we hear more news about bonus features and whatnot. The most pressing question: will it come with the bong?